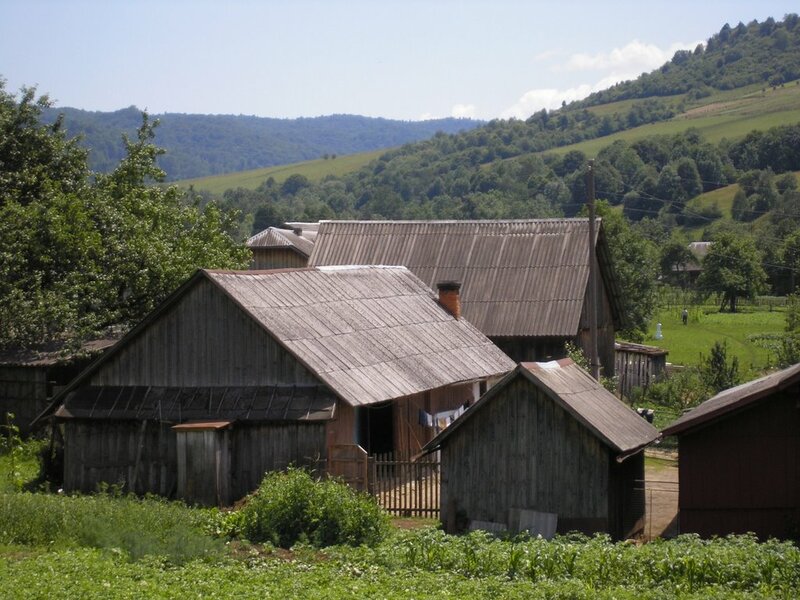 I invite anyone to view this journal documenting my search for family roots in Western Ukraine. Start with the first June entry in the archives and read the posts in chronological order. I've tried to be accurate and apologize for inadvertant mistakes. Feel free to post or e-mail corrections, comments or questions. I also have many more pictures that I would be pleased to share. The Internet has been crucial in my research and I'm happy to give back to it. 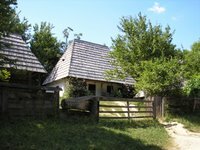 Hubici and Lacko are neighbors, located in the foothills of the Carpathians. Lapousanka and Verkhnie Vysotske are about an hour and a half away, deeper in the mountains but very close together, on the same road. 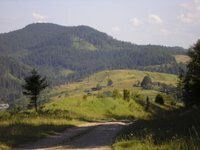 I took the opportunity to look at Komarnicki and Matkiv--origins of the family surnames-- since they were also along this road. Finally, I'd like to thank Oleh Iwanusiw, a Canadian who I've never met, for his exceptional kindness. The pictures he took several years ago of three women in a Hubici field proved crucial to my search. The Internet is a powerful resource! The picture at the top of the page is the road from Lacko to Hubici. 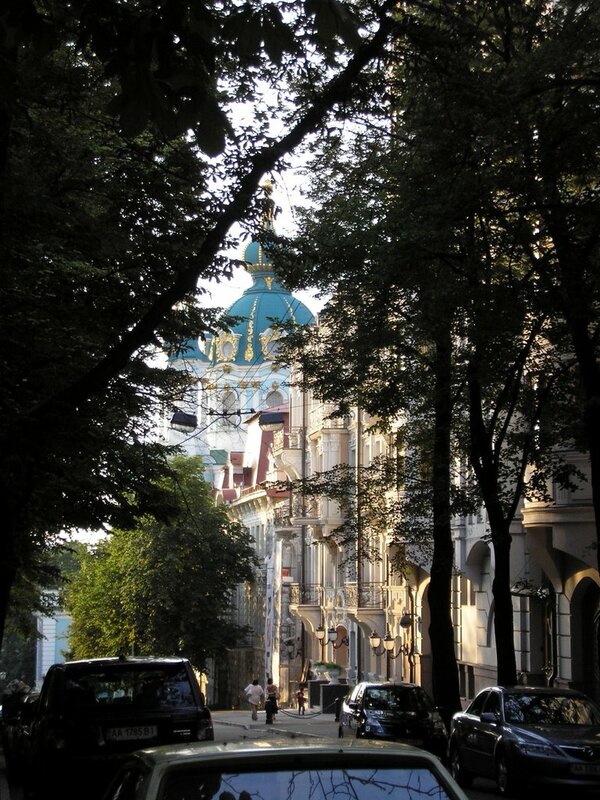 Kyiv is a very pretty city full of many green parks and beautiful, well-kept buildings. 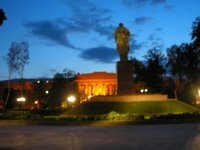 We stayed in the Taras Shevchenko University district and frequently sat in the park watching old men play chess under the trees. Alexander and I played Scrabble there last night. Independence Square is the site of what most of the world was watching during the Orange Revolution. There were activities and protests going on while we were there. The Ukrainian government is basically a mess right now and a tent city was starting to grow. 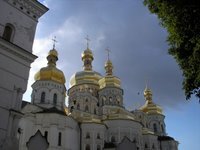 St. Sofia and St. Michael Monastery Complexes and St. Andrew's Church are some of the exquisite sites we just came across as we walked all over the city. We also visited St. Andrew's Rise-- a tourist area in one of the city's oldest areas where I bought some authentic embroideries and a pretty lithograph. 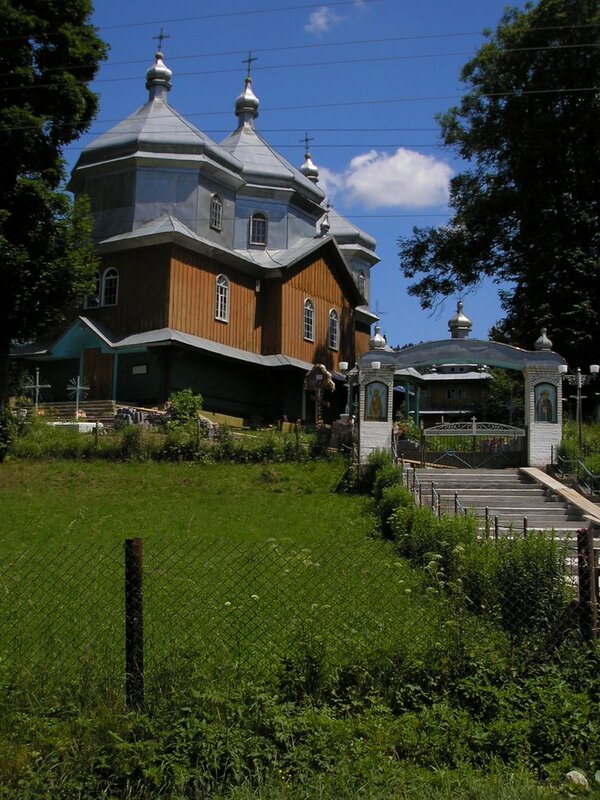 The Kyiv-Perchery Monastery Caves is home to mummified monks. It's extremely lovely but very scary with its claustrophobic tunnels, candles and flammable head scarves. The complex contains many state museums--a necessary trade-off for the monks since the government is restoring and maintaining the place. The Museum of Historical Treasures of Ukraine is wonderful. It displays a valuable collection of Scythian gold jewelry. There is also a good museum of folk history. Originally, we hoped to visit Chernobyl, scene of the world's worst civilian nuclear disaster. Instead of being science fiction's predicted wasteland, it has evolved for over twenty years into Europe's largest wildlife sanctuary, teeming with animals and birds, many of them rare, endangered and highly radioactive. Alexander thought that haunting imagery like herds of wild boar crashing through abandoned apartment houses might eventually work its way into his poetry. Alas, we waited too long. Either plan such a trip while in the States or give yourself at least 48 hours when you get to Kyiv. I'm very glad Alexander insisted on coming here. It's much different than I expected. We had a pleasant stay and were able to decompress after the excitement of finding our new family. I'm also glad he insisted on coming back to the same guest house in Krakow. It was a good call. We're sleep deprived and frazzled. It was soothing to return to a familiar neighborhood and not have to make any new adjustments. We traveled several hours southeast of Lviv to Zhuravno to meet Michael, Marco's youngest son. Michael said that his father was just 8 when grandpop left for America in 1903. 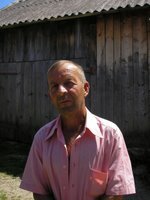 Marco grew up to be a farmer, married and had 4 sons (Vasil, Ivan, Stephan, Michael) and two daughters (Catherine and Anna). I met many of the clan today. Such very nice people! All of them, men and women, are educated--there seems to be a large contingent of doctors and engineers. They were very hospitable to us and appear to be a really close family. Michael, the patriarch, is an interesting man. He had to leave the table for a while to remove a fish hook from a small boy. Michael has the reputation of being an exceptional surgeon. The family showed me a newspaper clipping documenting a remarkable feat-Michael treated an emergency shooting accident with open-heart surgery. This in itself is amazing since the conditions in his small, rural clinic are primitive, at best. However, things became more astounding when my cousin stuck his finger in the hole the bullet left in the heart to stop the bleeding and then continued to repair the damage. The man is still alive today! He claims he was the only child in his big family to be educated because he was the youngest. The timing was just right to take advantage of the Soviet education system. All this time I've sentimentally projected that only in America could the great-grandson of people from, at the time, the poorest country in Europe go to Harvard, one of the world's best schools. In truth, these cousins of my generation are all very well educated, courtesy of the Soviet government. Most of the people we've talked to are extremely concerned about Ukraine's future. They are bitterly disappointed about the hopes the Orange Revolution raised and did not deliver. Marco, a respected surgeon for over 50 years, gets a monthly pension of $85. 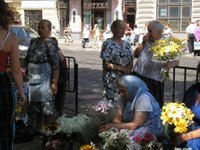 Over 8 million Ukrainians are working abroad and sending money home-much like it was for our relatives in the early 1900's. Ukraine looks shabby today because the Soviets built apartment houses with reinforced concrete that was meant to last 25 years and be replaced with better housing. This never happened. 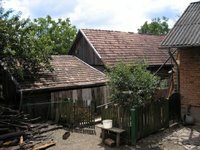 Many of these dwellings are now falling apart and there is no money in the coffers to rebuild. We did see evidence of wonderful new homes in the process of construction. They were just abandoned when the Soviet Republic dissolved and the job market dried up. The Soviets brought electricity to everyone. 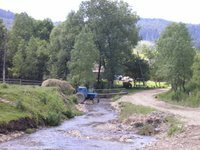 Gas lines are being run to the small villages but installing them is problematic and some people, like those in Hubici and Lacko, have been waiting for years and may continue to wait for the possiblity of an easier life without chopping wood. 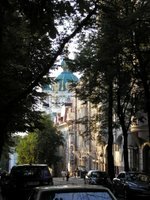 Lviv has just gotten a bundle of money from UNESCO to do some repairs before its big birthday bash this autumn. The cobblestone streets were a mess with construction--should be beautiful, however, when done. The city has great old bones with fantastic Austro-Hungarian architecture but badly needs paint and prettying up. I got a chance to do research in the Archives and was able to handle the old books themselves. These records are in Latin,not Cyrillic--which is a plus but it is still a difficult place to navigate. You must first find if they have what you need which is tricky since the clerks don't speak good English although they are very accommodating. We cobbled together a conversation of Ukrainian, English and French and seemed to make ourselves understood. The Wysocko records I wanted to see were not there but they did have some Hubici books. It takes at least two days to bring the records up from the huge basement vaults so it's best to visit the Archives on the first day of your stay or to write telling when you will be in Lviv and what you need. (archives2000@lv.ukrtel.net). I spent 2 hours looking through Hubici birth records trying to find info about Marco. I kept wondering why there were no Wojtowicz (Voytovich) births for almost a hundred years when the graveyard is full of this name as is the village. I then discovered that there is another Hubici in the Sanok district of Poland, once part of Galicia, and that I was looking through the wrong records! We were leaving for Kyiv in a few hours so there was nothing I could do about the mistake. I also discovered that they have Cadastral land records for our Hubici. These are detailed maps showing the plots of land and their owners. 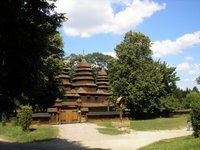 Lviv has a terrific folk park nestled in the woods, full of authentic houses and churches from all the oblasts of Ukraine. I finally saw examples of the fireplace shelves where the kids would sleep in the winter. Grandmom spoke of these and also of the thatched roofs that we saw. Cousin Lesya invited us to dinner in her new flat and since she doesn't cook, Cousin Yaraslav helped in the kitchen. It was a tasty and cozy meal, another example of our family's generosity and kindness. I was upset to learn, however, that Catherine, Marco's only surviving daughter, sat at her window in Lacko waiting for us to visit. Supposedly she remembers my great-grandmother Eva very well and wanted to talk about her. I charged Cousin Yaroslav to act as the family historian in my stead and question her about the past before she dies-she's 87 and ailing. Modern Ukrainians don't seem too knowledgeable about their family's past. Few seemed to know much before their great-grandparents. Everyone was excited by my research, however. Maybe I've sparked some interest. This was really a terrific, terrific experience-I'm proud to be related to the people we met! 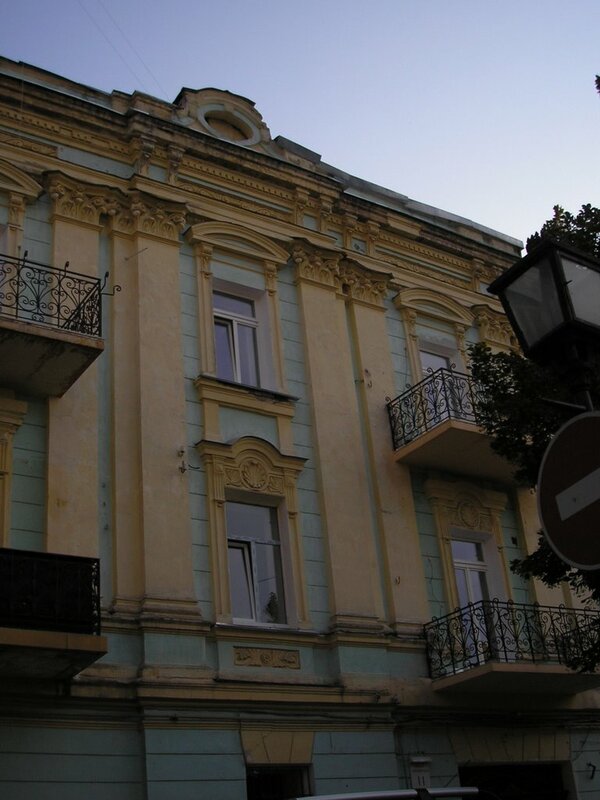 Emotionally and physically drained, we arrived in Lviv to find a beautiful flat awaiting us. 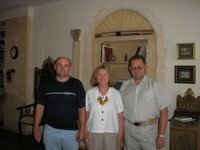 The apartment is one of several owned by two Canadians and I highly recomend them (lvivrent@rogers.com). Hotels are quite expensive in Ukrainian cities while short term rental is cheaper and more convenient. We were very pleased with this place. This morning the door bell was impatiently buzzing. Two enthusiastic men, contacted by Yaraslava, came bounding in waving a photo of my grandfather as a young man! It's true- Marco was Grandpop's brother and these people are my cousins. 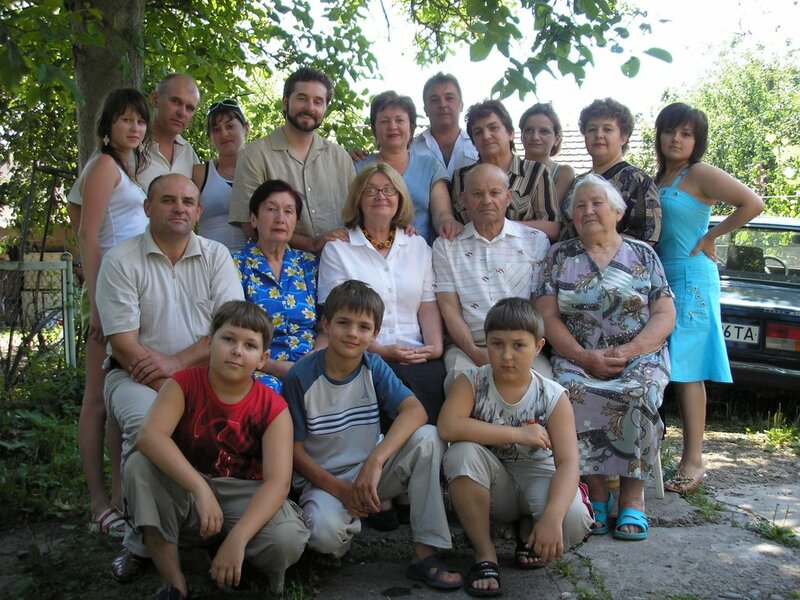 We went to Cousin Yarislav's (all these Yaraslav's are confusing!) home for lunch and catch-up. Fortunately his very pregnant daughter, Maria, spoke good English. The family is lovely and was very gracious to us. His father-in- law, a charming old man, has an interesting story. He was born in East Ukraine and his family hid some Jews when the Germans came through. He and his father voluntarily left for Western Ukraine because their presence raised the possibility of the house being searched. He married and got a job as a bookkeeper for a good company. Times were confusing and no one checked his educational credentials. Eventually he worked himself up to the number two spot in this large company as head accountant-- without training, just ability and drive. The man has had a very good life and the Jewish woman they hid survived the war and communicates with them. It was frustrating to discover that someone was waiting to show us Grandpop's house in Hubici. Even though the building is now a Roman Catholic church, it has changed little from when Wasyl and Marco lived there. 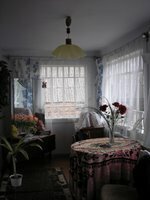 Grandpop's best friend lived across the street and a very old grandson of his still lives there. Grandpop wrote him letters for years but everyone thinks they were burned when it wasn't politically practical to have relatives in the West. Tomorrow we will kidnap translator Slav and visit Michael, Marco's last living son. A surgeon still practicing at 77, he has tried for 50 years to find out what happened to his uncle--my grandfather. Should be exciting! We went to the District Archives in Turka to search for my maternal grandmother's birth record but had no luck. There are several Wysockos, the town listed on her shipping document with the Polish spelling, and I'm not sure which one is hers. Turka is a depressing place, really backward but the clerk at the Archives was accomodating, searched many of her books and would take no payment. It is important to be proactive in any of the Archives. The door was locked with a sign saying they were busy updating records. Slav knocked anyway and found them helpful and polite. And a little cash can't hurt. At Slav's suggestion, we bought some potatoes, sausage, bread and beer, found a lovely spot off the road and made a fire. When the ashes died down, we roasted the potatoes and cooked the sausage. A real feast! The stars in the mountains are extraordinary! We slept with the windows open and lots of blankets against the night chill. Next we traveled to the villages of my maternal grandparents. I am assuming that these are the correct towns. All these Wysocko's are confusing to me. Marriage records state that Grandmom's mother's name was Mary Meshko-- a name that has been a total blank to everyone we've asked. Records show that Grandfather Fed's mother was Alice Molefish. That has to be wrong--perhaps he had a cold when speaking to the recording clerk! It's frustrating to be here, perhaps never again, and not know if it's the right place. I've researched in America for ten years to find the little that I do know. It's even harder to look here. The records are spread all over the place. Supposedly after 70 years they're sent to the National Archive in Lviv but that certainly hasn't been my experience. The many wars and changes in governments have wrecked havoc on records. And, of course, the language is a big stumbling block. The records are in Latin but the clerks speak Ukrainian. This search would have been absolutely impossible without Slav. Our first stop was Lapousanka. Again, I'm not certain that this is the birthpace of my poor grandfather who died in the 1918 Flu Epidemic. I was able to find only one person in all the shipping documents who matched him in age and name-- I even had a search done from Hamburg. There were very few Theodor (Feydor) Komarnicki's who came to America. I tried every possible spelling. I couldn't find his WWI draft record, though it certainly should be out there. He arrived in America and died there between censuses and he was in no city directory that I've ever found. I went all the way to Jerome, PA where I think he died, only to discover that the church records had been destroyed in a fire. So many people died during this calamity that no death certificates were issued. My mother remembers, at age 3, her father's body lying on the porch for days before anyone could bury him. When I got near the cemetary where I think he is buried, my car died and had to be towed away! This man didn't seem to want to be found. I feel bad that no place on earth acknowledges that he briefly passed through although the genes of all his descendants certainly leave a record of his existence. Anyway, once upon a time in tiny Lapousanka was born a Theodor Komarnicki with a father named Jan but a mother called Justina nee Halewier (sp),not remotely Alice Molefish! This young man went off to America to join his older brother, Antoni, yet my mother said her father had no family in America. I did discover that Antoni was married and had a family back home and that he traveled through US customs several times. Perhaps WWI prevented him from re-entering and he stayed in Ukraine. I met a man named Komarnicki who claims he is a relative of Theodor. But he had been drinking and was standing next to the village priest when we explained our quest so I don't know if what he had to say was based on fact or fantasy. He was cordial, courtly even, and invited us in to see his house. I took his picture and will examine it further for family similarities. Geneaology is full of projections and assumptions and fictions. I'll probably never know the truth. 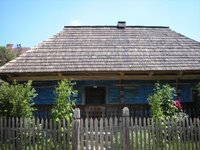 So I've had to re-adjust my goals and expectations and realize I was fortunate to be here in the land of my East Slavic ancestors. They probably all moved around so much over the centuries that specific villages are arbitrary and unimportant. It is becoming rarer for individuals to have all four grandparents born to a group of people who have lived in the same area for thousands of years. That's why I sent my DNA to the National Geographic Genome Project (WWW.NATIONALGEOGRAPHIC.COM/GENOGRAPHIC.) They're tracking the deep DNA passed practically intact from the mother's side if you are female or the father's side for males to determine human migrational patterns. Apparently, every human being on earth is related to two people who lived in Africa. The earth has been populated by the various migrations of the descendants of these two blood lines. My mitochondrial DNA belongs to the Haplogroup H, a large lineage whose geographic distribution reaches as far as northern India and central Asia. Half of all Europeans are group H. Interestingly, my people are from the White Croate tribe of Eastern Slavs, believed to be related to the Persians. It was less exciting not knowing whether I had a connection to these towns (unlike Hubici and Lacko)--besides we were all getting tired of graveyards. We went through Lapousanka and two Wysocko's pretty quickly. The area was quite lovely but financially depressed. 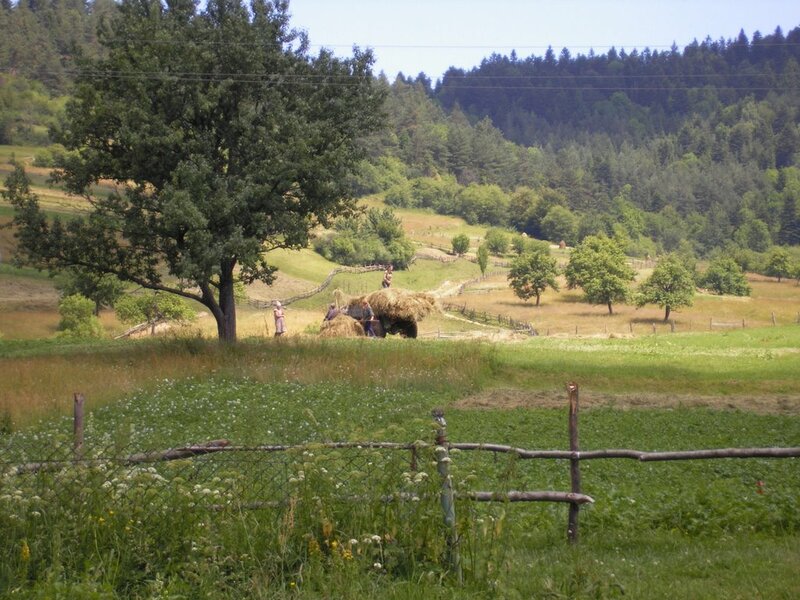 It is more mountainous then Dobromil yet the farms were much like others we have seen. The villages I was interested in were all along the same country road, one after another. We stopped in Komarnicki and Matkiv, the town origins of our surnames. I even stopped in Mokhnate to take some photos for someone I've corresponded with online for years . I spoke to several people about the German guest worker program. Nazis just took women from the fields to work on farms that the German soldiers had to leave unattended when they went off to war. Many women stayed because the conditions were often better than in their hometowns. Some wrote back that they were treated very well by the host families. I can't imagine that all 4 of grandmom's sisters died at Auschwitz. I'll never know until I discover their names and I won't be able to do that until I find the right Wysocko. Needing a break, Slav suggested we spend our remaining time visiting some nearby towns. Ancient Uzhgorod is located on both sides of the Uzh river and is only 1/2 mile from the Slovak Republic and about 10 miles from Hungary. There is a large Hungarian influence in the architecture and street signs,etc. It is a very pretty place with a lovely central pedestrian thoroughfare. We had a great meal in a coal mining-themed restaurant that Slav knew. A 15th century castle has a good collection of local musical instruments and houses the Regional Museum and Art Gallery. Next door is the Transcarpathian Museum of Folk Architecture and Daily Life. Both sites are very interesting, informative and worth a look. We visited another well-restored castle on our way back to Ivano-Frankivsk, in the town of Mukachevo. It is sometimes referred to as Palanok Castle and is quite impressive. We based ourselves next in Ivano-Frankivsk to eat and sleep. The architecture is very Austro-Hungarian. This fair-size city is clean and pretty and I'm sure there is a great deal to see but we didn't have time to do so. Lovely Kolomyya is in the heart of Hutsul country. 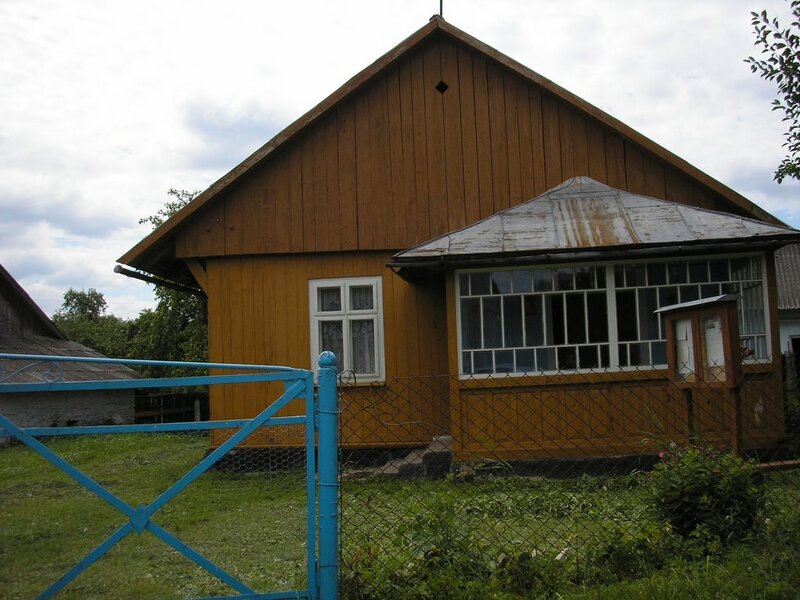 We went there to see the Pysanky Museum and also the Museum of Folk Art of the Hutsul Region. There are several ethnic groups in the former Galicia-now Western Ukraine and southeast Poland. The Lemkos were based in the foothills of the now Polish Carpathians until WWII when 200,000 of them were forceably relocated to break up their fierce resistence movement. My family belongs to the Boyko group who have traditionally lived in the foothills of the Carpathians in today's Ukraine. Both the Lemkos and the Boykos were serfs for Polish landlords and belonged to the land until 1848. The Pysanky Museum, shaped like a huge Easter egg, was also worth the trip. The practice of "writing" a pysanka goes back thousands of years into a pagan past and was almost eliminated by the Soviet regime. Magical powers were attributed to eggs and it was believed that they influenced the fertility of crops, the offspring of cattle and the birth of children. Vira Monko writes in "The Ukrainian Folk Pysanka": "There is no other subject in all national art which condenses in itself such figurative and symbolic matter. The pysanka was given as a gift to signify reconciliation, or to symbolize one's wish for good health, beauty, strength or for a good harvest. It was also used to prevent natural calamities. The pysanka was seen as a factor in curing various illnesses, and it was used to combat curses and fear. It was rolled over grass and buried underground in fields to ensure that the wheat would be full and that the oats would ripen. The pysanka was also placed under beehives, to ensure that bees would perpetually swarm within the hive." Only women could decorate the eggs and they could not deviate from specific designs. In any given geographical area, pysanky were decorated with exactly the same symbols for centuries. 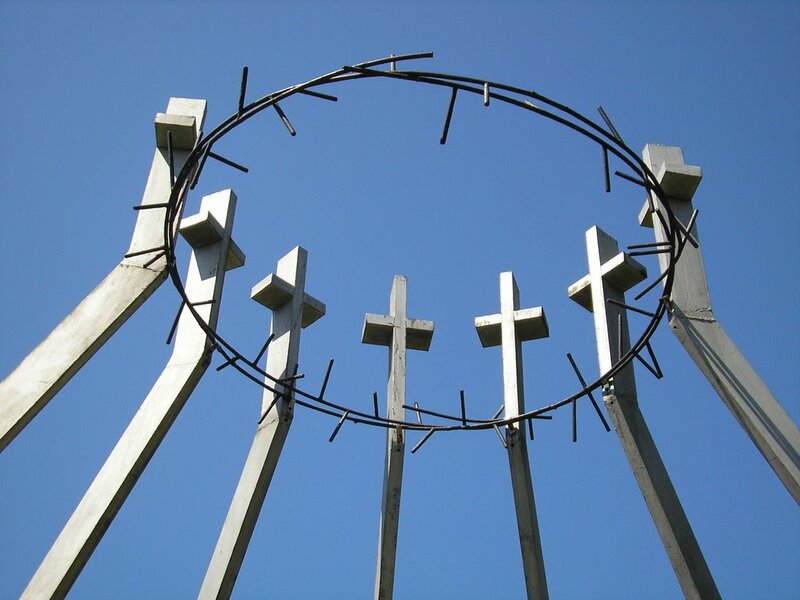 Each symbol was part of the greater collective prayer which would be incomplete and, therefore, ineffective, without each community's piece of the puzzle. The ritual began on Holy Thursday and included water, wax, fire and dye-each having a symbolic ritual meaning. The writer had to be alone, in silence and in a prayer--like state of mind. She had to sing specific words and think specific thoughts as she wrote. Unfortunately, these songs have not survived. She had to calm herself and not be angry with anyone. Fertile eggs from birds who had never laid before were used. The dyes were from natural substances such as onion skins and their containers had to be new. Pure bees wax was melted over hot coals taken from the fire because it was believed that "living fire" had strong magical powers taken directly from the life-giving sun. The designs and colors all had meanings, many lost to antiquity. I wish I had more time to explore this city-one of my few regrets of the trip. Yaraslava remembers as as small child seeing soldiers herding a large group of people to the shaft of a nearby salt mine and throwing them down to die. Her grandson, Vylodia, took us to this spot which is in an especially bucolic setting. A monument marks the place where either Germans or Soviets did the deed. To this day, neither group admits to it and the locals have conflicting stories. It's possible that Soviets first killed Ukrainian and Polish dissidents and threw their bodies down the shaft. Later the Germans forced Jews to retrieve the bodies and bury them. Then they threw the Jews in the mine. It is rumored that over 4,000 people died. The story is very typical of the confusion and denial that people have about the past. The more questions you ask the more answers you get. Each is a different version of the truth. The tricky part is putting them all together and arriving at a conclusion. I'm very pleased with the results of my stay in Hubici and Lacko. For so long I've wanted to actually see the land of my ancestors and perhaps understand myself better. My grandparents, typical of immigrants, believed that once in America, they should forget their homeland. They passed on a little of the language, foods and traditions but not a lot and said almost nothing about the land and their daily lives in it. And no one asked! Everyone was dead by the time I was interested and none of their surviving children knew anything-not even where this mysterious Galicia with its constantly changing borders was really located. Was it Polish, Russian, Austrian or Ukrainian? My parents, like many first generation Americans, wanted more than anything to assimilate. They did not teach us Ukrainian but used it to talk about things they didn't want us to understand. 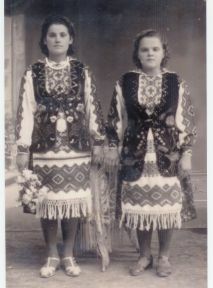 Therefore we couldn't really communicate with our grandparents and much was lost to us about the culture of our people. Food was the main link to the past- even today when I'm sick or lonely, I comfort myself with pierogies! I really enjoyed meeting these people. I could grow very fond of Vylodia who reminds me in many ways of Alexander--they are both serious, sensitive, kind and funny. And I am deeply thankful to Yaraslava for both her hospitality and research into my grandfather's past. Just as we were leaving Dobromil, the hotel owner related that a kindergarten teacher, perhaps the daughter of the old man named Wojtowicz, had come to see us. We didn't have the time to seek her out. Alas, who knows what stories she had to tell! 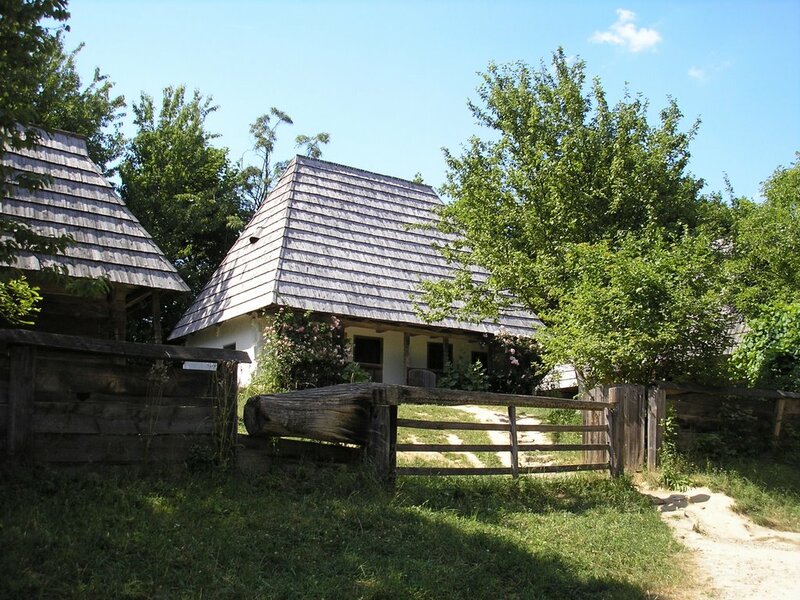 We left Hubici and headed to the villages of my maternal grandparents, deep in the heart of the Boyko's land. The gentle hills of Hubici turned into real mountains. It's beautiful here. 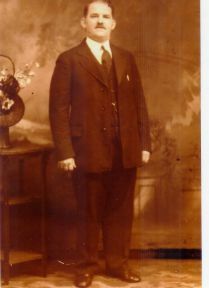 I have been looking for years for information regarding this man who died before his 30th birthday in the 1918 flu epidemic and left Grandmom a 21 year old widow with 3 babies and a dead brother, also a victim of the flu. Scores of people were gathering flowers along the road and among the nearby trees. They must be preparing wildflower garlands for the Eve of Ivan Kupala, that celebration Lacko's priest cautioned his congregation about. There is an ancient belief that this is the only night of the year when ferns are blooming. Whoever finds a fern-flower will become immensely rich. I'll have to check out Gogol's story "The Eve of Ivan Kupala" when I get home. Another wonderful day full of surprises! We attended mass in a pretty little Ukrainian church in Lacko, home to my paternal grandmother, Agnieszka Cycyk (Cicik). As is common in the Soviet era, the town was renamed and is now called Solianuvatka, perhaps in tribute to the nearby salt mines. The service was lovely. Greek Catholic and Ukrainian Orthodox mass is completely sung by the priest and congregation who mostly stand or kneel. The interior was sparkling fresh, the pews decorated with embroidered banners on poles. Icons draped with long embroidered cloths complemented the colorfully stenciled walls. Above the altar hung little sparkling white Christmas lights. An icon-rich roodscreen separated the priest from the people while he prepared the sacrament. Maybe thirty men and women were attending mass in this small but intimate church. The priest's sermon addressed the coming holiday known as Ivan Kupala Day-- a kind of summer solstice celebration harkening back to pagan fertility rites and one of the most expressive East Slavic folk holidays. The Orthodox Christian calendar has associated it with John the Baptist but it still contains pagan elements--like jumping over flaming bonfires and throwing flower garlands in the river. The priest cautioned the congregation not to get so caught up with the pagan rituals as to forget the Christian meaning. Unfortunately, we will be on the road on July 7th. The older women took us on a tour of the cemetary where we looked for the names "Cycyk" and "Bobko", the maiden name of my great-grandmother. Searching through cemetaries is proving challenging. The grass is cut infrequently and was quite high, slippery and hid holes. I brought materials to make gravestone rubbings but the monuments were often of welded metal or shapes not easy to rub. Photos of the deceased are sometimes on the grave marker, either encased in glass on the older ones or etched on granite on newer tombstones. It was exciting to search for family look-alikes. The stones are inscribed in Cyrillic and would have been difficult to impossible to decipher without Slav's help. Hubici, my grandfather's birthplace, was just down the road. Large nests were perched high on electric poles. Slav explained that they belonged to white storks, thought to be sacred birds bringing good luck to the families they grace with their nests. These are never disturbed and sometimes the storks come back year after year, building higher and higher. About five years ago I corresponded online with a very kind man from Canada who was familiar with this area and visited often. I paid him a modest amount to take some pictures of a land that I never dreamed I'd see with my own eyes. By chance, he photographed a child, her grandmother and great-grandmother. The oldest woman, Anna, was a Wojtowicz by marriage. 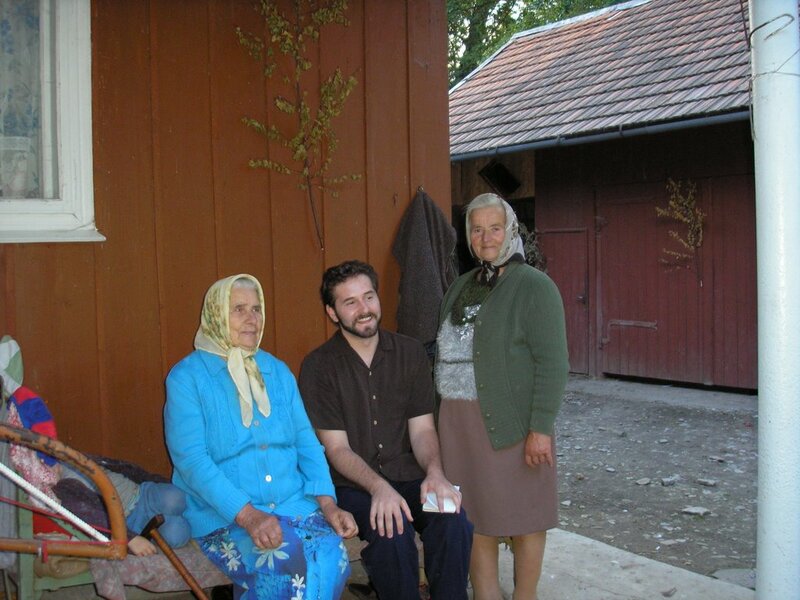 I was touched by the picture and sent her a letter in Ukrainian asking if we were related. I never received a reply but often thought of the three of them as I planned this journey. So as the congregation emerged, I kept searching for Anna, hoping she might still be alive. Suddenly a woman approached me and asked if I had once sent a letter. She was the woman in the photo, Anna's daughter, and a Wojtowicz by birth! I was saddened to learn that Anna, in her nineties, had died a few years ago. Yaraslava then graciously invited us into her home. It seems that she had replied to my request for information but I never received it. It was interesting to see the inside of one of these small, square cottages. This one is extremely tidy and pleasing to the eye. There are four multifunctional rooms, all furnished with beds piled with pillows to be used as couches during the day and a small round table with chairs. Several generations live in this compact home and each manages to carve out a personal space. The walls are covered with colorful tapestries. 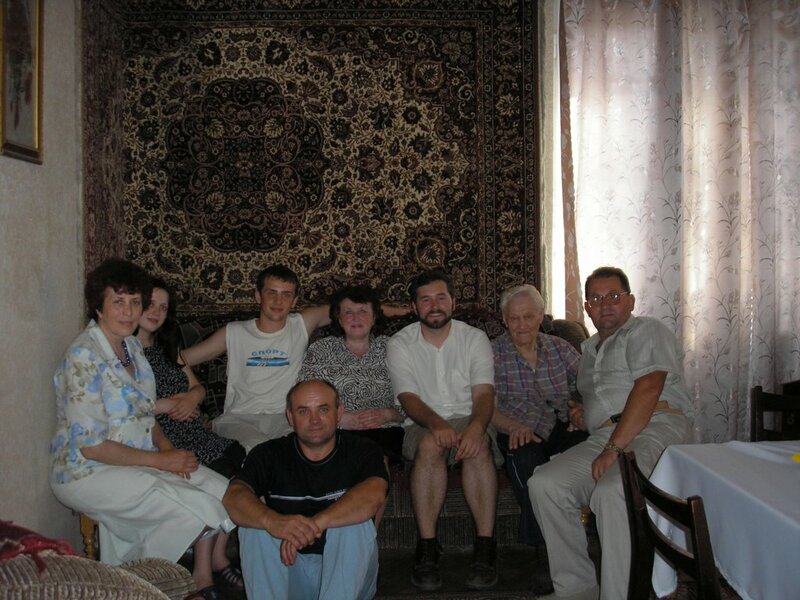 Family photos and icons are draped with rushnyki, the long, embroidered ritual cloths popular with Ukrainians. There is no indoor plumbing or gas heat but a well and an outhouse are just outside and each room is heated with a wood-burning tile stove. Life will be so much easier when the gas line eventually comes to town. A summer kitchen, with a wood stove, stood adjacent to the main house and this was where, without any notice, Yaraslava graciously prepared lunch for us. She served many small dishes full of tasty goodies, including a terrific cake made by her daughter, the town's most noted cook. We toasted with vodka and got to know each other, thanks to Slav's unobtrusive translating. The highlight of the meal was a large, steaming plate of homemade periogies! Yaraslava discovered that Grandpop had a younger brother named Marco who had 4 sons and 2 daughters. This was very surprising to me since my grandfather never spoke of him. Shortly before this trip, however, I found the WWI draft record of my grandmother Cicik's brother and for the first time learned of the town of Lacko. Yaraslava's independant research showed that Marco had an older brother, Wasyl, who left for America and there married a girl from Lacko. So it sounds as if this could be my grandfather! 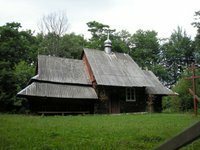 Yaraslava's grandson took us to see a 550 year old wooden Boyko church proportedly a 20 minute stroll away. I'm starting to understand that Ukrainians walk much faster than I do! It took us about an hour of forging small rivers, wading barefoot through others, climbing beautiful, verdant landscape and eating startlingly good wild berries to arrive at a secluded spot deep in the woods. There stood a church that my people have been attending since the 1500's. We had obtained the key from the village priest and went inside to see some very old and lovely wood carvings. Tradition has it that a shepard fell asleep and lost his cows. He prayed that he would find them. A vision told him that indeed they would be found and he must, in gratitude, build a church on that spot--which he did. It is called, appropriately, The Church of the Shepard and is still used once a year by the locals for a special service attended by crowds of people. Nearby was a little chapel built on the spot where villagers said they saw the Virgin Mary and where a spring miraculously flowed out of the ground. We headed back to town close to one of the remaining border posts surviving from the Soviet era. Slav said Ukraine is the last closed door to the West, and many Afghans, etc. try to cross over to Poland where they can go anywhere undetected. So the border is not to keep Ukrainians and Poles apart but to regulate the comings and goings of other nationalities. It makes life difficult for everyone, however. The wait to cross the border can be 12 hours but wait they do because Ukrainians are able to make a living buying things on the Polish side and selling them at a profit back home--and the same is true for the Poles. Life will be easier and property values will climb when eventually in the unknown future this border crossing becomes defunct. 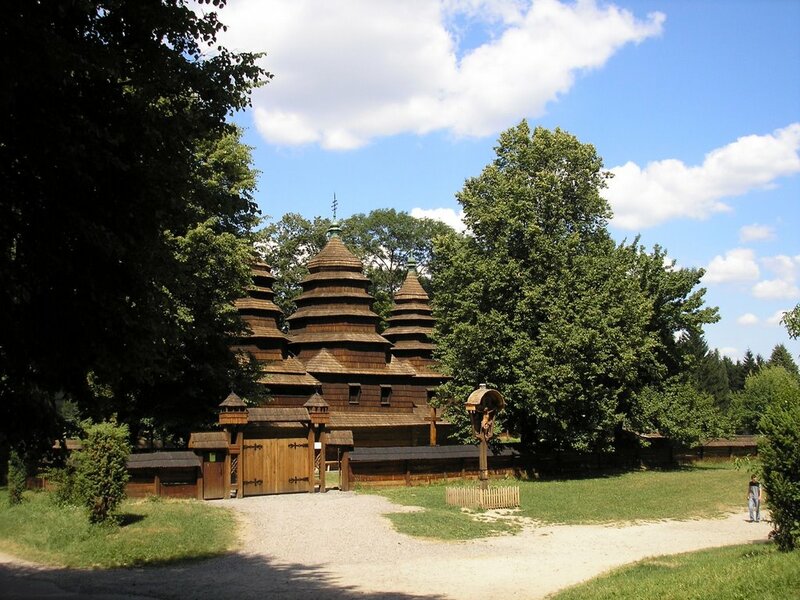 This wooden church is also a special pilgrimage site for the people in nearby Poland but, for decades, the fence has shut off easy access. 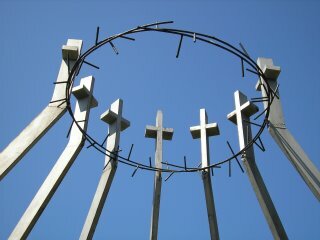 It is the last Station of the Cross for those seekers willing to navigate the complicated political waters. When we got back, Yaraslava's daughter had prepared another great meal. We spent a long time talking about Ukrainian traditions and also about our lives. They verified my childhood memory of being at Grandmom's house on Ukrainian Christmas Eve and throwing honey and barley on the ceiling to bring good luck. No one else in my family remembers this. I also recalled the hay under the tablecloth and table to symbolize the manger and feeding the animals on Christmas Eve-- a night when they are suppose to talk. These people do all of this (they make special donuts for the animals) and my grandparents sought to keep the traditions alive. Yaraslava told us that when she was young, Soviets forced her family along with 6 others, all leaders in Hubici, to board cattle cars bound for Siberia. She spent 7 years there under odious conditions. 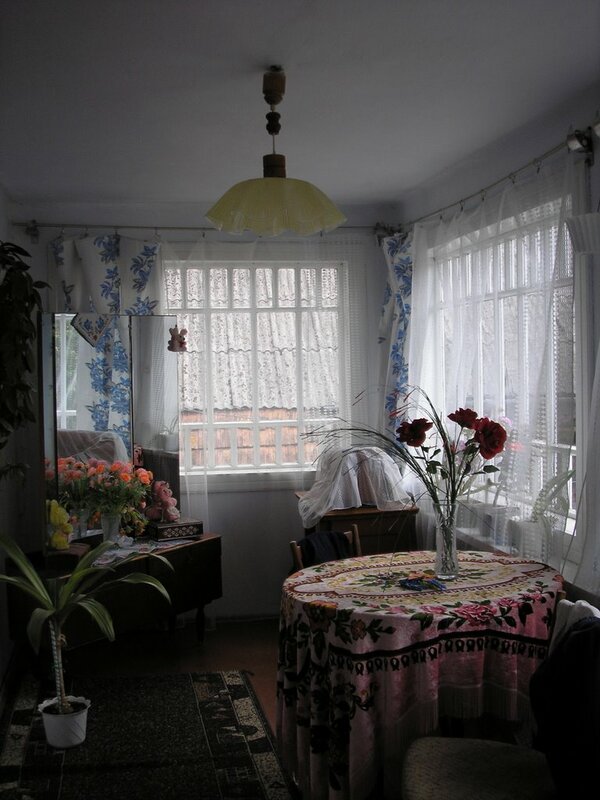 When she returned, her family home had been given to resettled Ukrainians from Poland. It took them 10 years to buy another place. She looked very sad describing these difficult years that had robbed her of a childhood. She then took us for a tour of the farm. The villagers live in very close proximity to each other in small compounds which are surprisingly compact but their fields are a distance away. 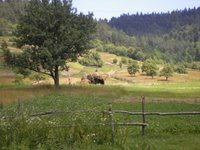 Each day, a different famiy is responsible for taking the village herd of cows out to pasture. Everything is very orderly. 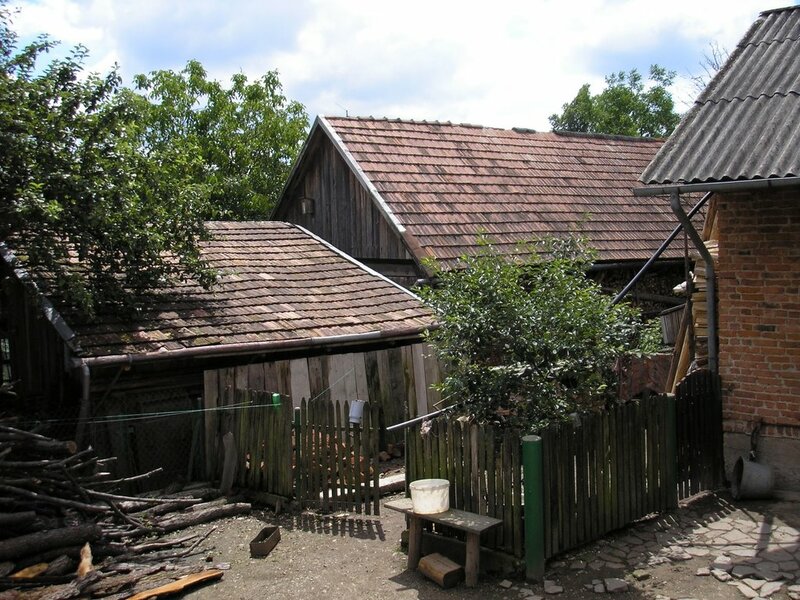 One of the buildings contains 3 cows, a pig, chickens and geese. This building is only a few steps from the house but did not seem unsanitary. Rabbits are raised for meat. Many households keep bees for the honey and wax. They have their personal garden here and many fruit and nut trees. All of this produce will be canned or dried for use in winter. They make their own cheese and sausage, also. Forages into the woods for berries and mushrooms supplement what they raise. Yaraslava's son-in-law, holding a jar of fabulous wild raspberries, said it was an enviromentally correct existence--that they used absolutely no chemicals. So basically the community stays close together for support and companionship but travels quite a bit to farm the land. It is a hard life, though not a bad one at all. The pace is slow and steady and each day is spent in meaningful work. In the evening, we went to visit Yaraslava's Aunt Stefania, widow of Marco's son, Stefan. We hoped she would remember either Marco or my Great-Grandmother Eva but she's very old and wanted to talk about her own life and travels. We had alot of fun singing songs with her. Stefania is a poignant example of an intelligent woman whose life would have been much different had she been educated. Her grandson, perhaps a cousin of mine, took us back to the cemetary to see the graves of Marco's sons Vasil, Ivan and Stefan. I found the place where Grandpop was probably born but it has been converted into a Roman Catholic church. All in all, it was quite a day!! I became interested in genealogy more than ten years ago when my son had to build a family tree for school. I was dismayed to realize how little I knew about the people and land that formed our heritage. My relatives left almost nothing in the way of a paper trail so I had to be creative and persistent. Along the way, I met many people and learned so much about history, geography and being part of a larger whole. Finding lost family was totally unexpected and made the experience seem like a fairy-tale!